Recently, Help Desk Migration added a new feature to their Migration Wizard - data export from SmarterTrack platform! Note: the appearance of some of these records may differ in a new platform due to the unique data structure in SmarterTrack. There’s a great perk of migrating from SmarterTrack as it allows transferring data without admin rights. For instance, you don’t have to log in as the owner of the business account because the system will allow you to migrate all the tickets from the account of a simple support agent. Because of the API peculiarities, the name of the end-user is taken from the email. After the migration, the name of the end-user will only contain the text before “@” sign in the email. For example, if the contact’s email on SmarterTrack is “contact@test.com” than on the target platform the name will be “Contact”. There is such a thing as Department section for your agents in SmarterTrack. They consist of smaller Groups, however, during the migration, only Groups will move to the target platform. Simply because many help desk platforms don't have Departments in their structure. No worries, all agents will be assigned to the appropriate groups. 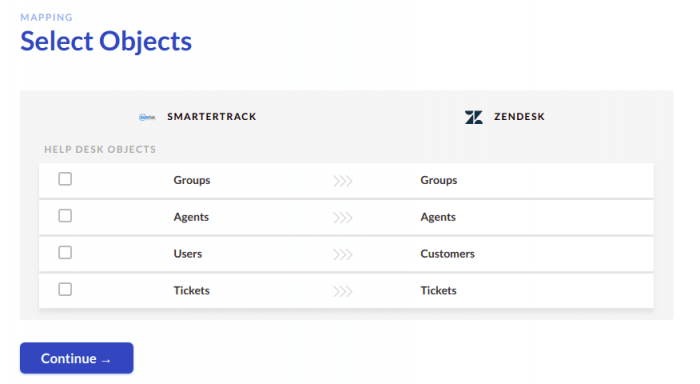 There is such ticket feature as Internal Attachment in SmarterTrack. All of these Internal Attachments will migrate into one single internal note of the ticket. The created_at time of this internal note will have the creation date and time of the first comment to this ticket. Important! If your future help desk doesn’t have internal notes in its system, we won’t be able to migrate the attachments. In SmarterTrack, agents are able to save their replies as drafts. Our tool can migrate them, however, they will migrate in Public Notes. After the migration, you can find your inline images in the Attachments section. To make sure and see for yourself, set up a Free Demo Migration. You will get the first results of your export from SmarterTrack in a few minutes. Right after the demo, you will be able to check the data in your target help desk! If you have any questions or specific requirements for your migration, please check our Knowledge Base or contact us! Start you SmarterTrack Export now! With an automated, secure, and fast tool.